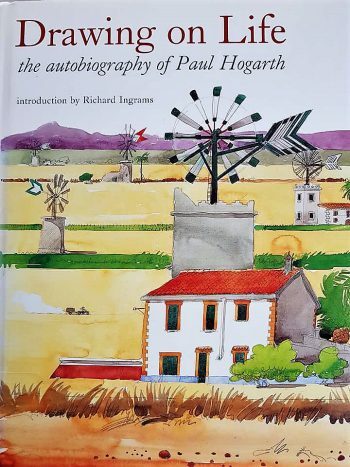 The artist Paul Hogarth’s autobiography remains one of my all-time favourites. Could an autobiography be better illustrated?! Hogarth (1917-2001) was responsible for many of the great illustrations for works by Graham Greene, Brendan Behan, Peter Mayle, Robert Graves and many other book covers as well as quite stunning landscapes as an artist in his own right. Published by David & Charles in 1997 it was Hogarth’s last book before his death and is testament to a rich and full life lived through some of the most remarkable periods of the twentieth century. Hogarth’s art took him across the globe to record people and places few had any knowledge of, in particular the Iron Bloc countries shut off from the West during the Cold War. 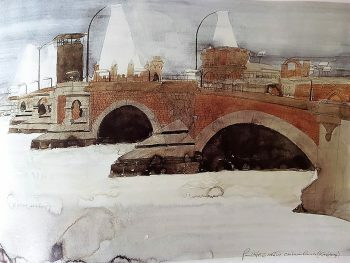 Take his painting of the Oberbaum Bridge in Kreuzberg, Berlin from 1981. Now ensconced in the Imperial War Museum, London, Hogarth describes in the book how it featured prominently in John Le Carré’s novel Smiley’s People. Hogarth was long on the political left and he began painting life in Poland and Czechoslovakia in the 1950s before venturing to the Soviet Union and China. Hogarth lay his proverbial hat in many countries but his work in America gave him a new, wider audience and he lived and taught art there during the sixties and seventies. He produced a wonderful trilogy of walking guides to Philadelphia, Boston and Washington as well as a fine book about New York with the enigmatic Brendan Behan. 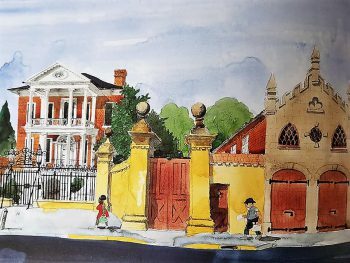 Opposite is one of his later drawings from 1984 of Miles Brewton House in Charleston. 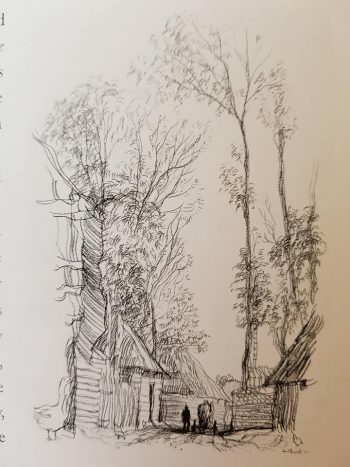 An ink, pen and watercolour of Brewton’s colonial mansion and one which typifies his work in recording some of America’s finest architecture. 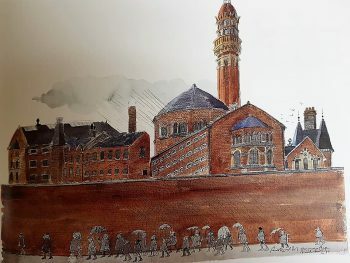 Hogarth loved architecture and the history behind the buildings, he wrote beautifully and concisely and offered these words in relation to his travels: ‘The exploration of artists, unlike those of tourists, are sometimes rewarded by the discovery of places not mentioned in the guidebooks. Artists also discover subjects of remarkable interest overlooked or unnoticed by more academic observers, although such deviations are bound to get them into trouble sooner or later’. There is an abundance of paintings and drawings from Hogarth’s earliest days until the late eighties. He painted beautifully but his ink and pencil drawings hold a special place amongst art and book lovers alike. Take a look at his work for Penguin and Graham Greene to understand his unique gift.